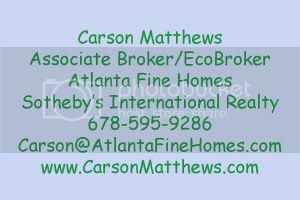 Each quarter I compile sales data from the Atlanta area to show a comparison of Green Home Sales vs. Tradition New Home Construction. This study looks at detached single family homes that were built 2007 or later and sold as “new construction”. The Green Home Sales Report looks at homes listed between $250,000 and $2,000,000 in Fulton, Dekalb, Cobb and Gwinnett Counties. The green homes have all been certified by a third party Green Building Certification including EarthCraft House, LEED for Homes, NAHB Green Building Standard and Energy Star. I like what you guys are up to at https://greentothescene.wordpress.com/atl-green-homes-sales. Such clever work and exposure! I wish I could do the same. Keep up the very good works guys I’ve incorporated you guys to my blogroll. I like the way you discuss things in you article. Direct and easy to understand. I usually get on the net to search something like with interesting to read on and with useful content to bare in mind and can be use with my research study. Thank you so much for giving valuable information and thank you also for allowing me to leave remark. Great info! I’ll be sure to pass this along! I was wondering if you have noticed a trend in green home construction moving from outer or “suburban” areas to urban areas. We are a green home construction company in Chicago, and sometimes the codes and restrictions in urban areas prevents us from building the green homes our clients want.